This unique picture book was inspired by the stone artwork of Syrian artist Nizar Ali Badr, discovered by chance by Canadian children’s book writer Margriet Ruurs. The author was immediately captivated by the strong narrative quality of Mr. Badr’s work, and, using many of Mr. Badr’s already-created pieces, she set out to create a story about the Syrian refugee crisis. Stepping Stones tells the story of Rama and her family, who are forced to flee their once-peaceful village to escape the ravages of the civil war raging ever closer to their home. With only what they can carry on their backs, Rama and her mother, father, grandfather and brother, Sami, set out to walk to freedom in Europe. Nizar Ali Badr’s stunning stone images illustrate the story. 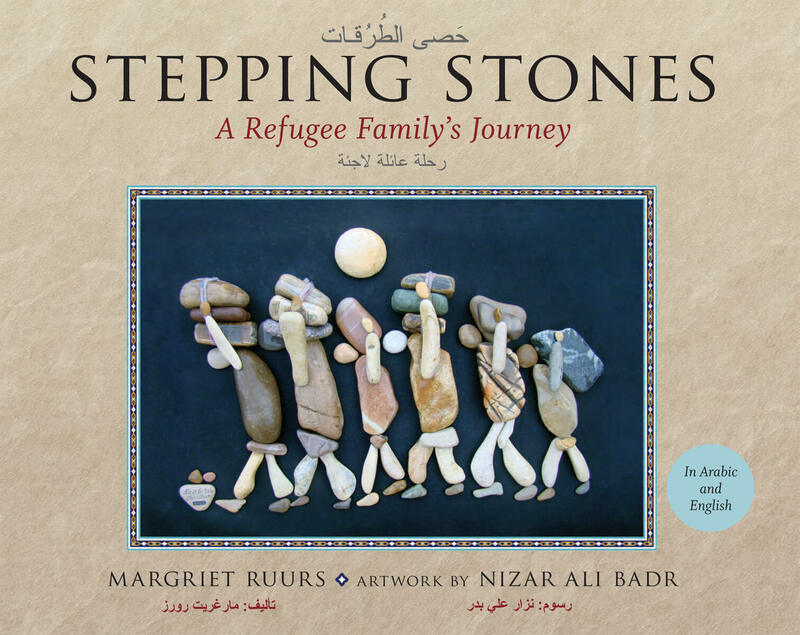 Stepping Stones: A Refugee Family’s Journey by Margriet Ruurs and Nizar Ali Badr is now available in a number of countries and languages. Originally published in a dual-language edition in English and Arabic by Orca Book Publishers, this best-selling story of one Syrian family’s journey to freedom is now available in Vietnamese (Kimdong), Dutch (Uitgeverij Kok), German (Gerstenberg), Turkish (Nesim), Portuguese in Brazil (Moderna), Korean (Chosen Education) and Spanish (Kalandraka). The book is also available in Australia in English from Queensland University Press. We are proud to announce that the sales of Stepping Stones: A Refugee Family’s Journey has raised over $60,000 for refugees in Canada. These funds come from the generosity and hard work of the author and the multiple schools, organizations, and communities across Canada who championed this worthwhile cause. With just one book, we have been able to positively impact the lives of many new Canadians—and we’re going to keep going! Thank you for your continued support. Orca Book Publishers is pleased to be donating funds raised from the sale of this book to Syrian refugees. Click here for more information. Aside from the funds Orca is donating locally, to the Inter-Cultural Association, funds will also be going to resettlement agencies for Syrian refugees including the Canadian Council for Refugees. And YOU can use this book as a fundraiser in your community. For more information click here. An astonishing book that allows the humanity of refugees to speak louder than politics.